It’s a common misconception that the only way to give back to your community is by donating money. The fact of the matter is, there are many ways to be philanthropic on a microcosmic level for little to no cost. Think about it like this: if donating money helps a cause on a high-level by providing an organization with the funds to start philanthropic programs, for example, then acting philanthropically without giving money consists of helping other people on more of a one-to-one basis, instead of in the abstract. Here are 3 ways that you can be charitable in your day-to-day life without breaking the bank. 1) Spend time volunteering: Whether you have a free afternoon or a free 30 minutes, there is always time to support a local cause. From reading a story to the kids at the library, to serving food to low-income communities, to simply picking up trash in the park, it not only helps to make your community a better place, but it also makes you feel good. 2) Donate blood: Donating blood is a simple and effective way to make a difference. Blood products are used by hospitals every day to save lives, so there is a constant need for new donations regardless of where you live. Research your local hospital’s blood donation program and find out what the process is for becoming a donor – not only will you feel better for having contributed a valuable resource to your hospital, but you’ll be helping members of your community in the most important way you can: by helping to save their lives. 3) Bring baked goods to your local firehouse: The men and women who fight fires across the country put their lives on the line each and every day, but much of their bravery and nobility often goes unnoticed. Bringing homemade cookies to your local firehouse is a great way to show that you appreciate everything that firefighters do to make your community a better and safer place to live, and it will mean a lot to them to know you’re thinking of them. 4) Talk to strangers: The next time you see someone eating alone at a restaurant, consider asking if you can sit with them while you eat. It’s easy to forego social interaction at the end of a long day, but sometimes, all it takes is a conversation to make someone feel less lonely. This plays into the idea of helping on a one-to-one level: small gestures of kindness can often mean the most. There are many more ways to help your community philanthropically without spending money, and if you start by doing these three things, you’ll undoubtedly find that opportunities for making a difference present themselves more regularly than you ever realized before. Good luck! My amazing Mastiff, Lola, loved to use Kiehl’s products, and always looked forward to bath time because of the soothing feelings that the products gave to her skin and coat. We love Kiehl’s and highly recommend the brand! Their new three-part product line called For Your Dog is amazing! For years now, customers have been requesting that Kiehl’s make products as luxurious for man’s best friend as they do for women, men, babies and even horses and finally our prayers have been answered! Cu ddly-Coat Grooming Shampoo ($16) helps to get rid of dirt and odors from your doggie’s coat while leaving behind a lovely lavender aroma. 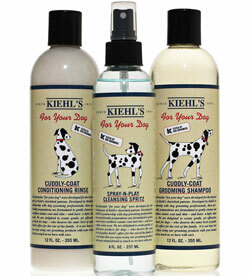 Cuddly-Coat Conditioning Rinse($16) is designed to nurture, moisturize and detangle the coat on your canine. The result is a clean smell, a soft touch and a glossy sheen! Spray-N-Play Cleansing Spritz ($12) is an easy solution for fussy dogs who are dirty but won’t take a bath. This “waterless shampoo” is great to spritz on between washings. It won’t irritate your pup and it can also be used for removing stains or deodorizing. Live to Love is an international network of non-profit organizations dedicated to creating lasting solutions to the world’s modern problems. Their name, “Live to Love” reflects the philosophy that positive actions creates positive results. “Live” refers to the life that we live as a member of this universe and “Love” is the positive attitude towards our life. Most of Live to Love’s model projects are based in the Himalayas with satellite projects around the world including North America, South America, Asia and Europe. In a rapidly globalizing world, each community, no matter how remote, is interconnected. It is with this in mind that Live to Love is dedicated to sustainable solutions. Carrie Lee is the President of Live to Love International. and she brings her cross-border legal expertise and her ability to build out institutional quality platforms to Live to Love. Her love of the Himalayas coupled with her love of empowering the next generation of leaders makes her a formidable advocate of the goals of Live to Love. There is a reason why so many people travel to Vermont to go on one of their breathtaking hot air balloon rides – it’s simply amazing. It is not just a ride or a flight, it is a life changing experience that you will never forget. I had the pleasure of taking a hot air balloon ride recently with Balloon Vermont and it was definitely a memory that I will carry with me for the rest of my life. Your experience at Balloon Vermont will include and is certainly not limited to everything from the anticipation and excitement before your balloon flight, to the wonder and awe that comes during the actual ride itself, followed by the pleasure that overwhelms you during the post flight toast as you reminisce over your amazing experience. During any of the balloon flights that you take with Balloon Vermont, you will discover many of the spectacular sights that Vermont has to offer. The beauty and majesty of Vermont in the fall is something that I highly recommend you see for yourself. From the rolling foothills of the gorgeous Green Mountains with the sparkling shores of Lake Champlain and the Adirondacks in view to the west, being in the balloon feels like you are soaring through the most beautiful watercolor painting that you have ever seen. You may also catch a glimpse of your colorful balloon reflection in a mountain stream or pond. You can even see animals from up in your balloon such as White Tailed deer, Grey Hawks, busy beavers, Blue Herons, black bears, wild turkeys, and even the ever elusive moose! When you land, they will bring you to a variety of destinations including but not limited to backyard BBQs, cow pastures, open parking lots to the city streets of Vermont. Balloon Vermont also offers personal tours once your flight has concluded of working Vermont farmhouses, where you are greeted by a playground full of amazed school children, and might even get invited onto a porch to drink champagne out of the land owner’s finest crystal. Now go and enjoy the ride of a lifetime before the vibrant colors of Fall fade away into winter! Giving to charity has always been seen as an act of generosity and compassion. It is looked at as being responsible and extremely caring. Many people donate money to charities that have a mission that they hold close to them. Others will contribute their time to charity by completing volunteer work. However, in today’s world, with so many different kinds and types of charities at our fingertips, choosing the one or ones that we want to support can become a bit overwhelming. This list represents charities who are not only focused on helping animals, but who are also trying to step outside of the box and take a more creative approach to the world of charities. Pilots N Paws – The Pilots N Paws site is intended to be a meeting place for those who rescue, shelter or foster animals, and volunteer pilots and plane owners willing to assist with the transportation of animals. Through the discussion board, foster parents and animal rescuers can connect publicly with pilots so they can set up the transport of each animal, as well as share all the necessary information to successfully accomplish each transport. This open communication platform allows other volunteers to offer their help if they see it may be needed to save an animal. Creative Artists and Rescue Animals – Creative Rescue was created from the passion that two women share for rescue animals. Their mission is to utilize non-profit arts organizations to create products, with the proceeds of their sales benefiting animal rescue groups. Free Kibble– Free Kibble is a website that was created by an 11 year old girl named Mimi, who wanted to feed the homeless pets at her local shelter. When you visit the site, you are asked a multiple choice question, and regardless of if you are right or wrong, you win! All you have to do to help provide food to animals who need it is click on an answer. Every day you click, Free Kibble will provide food to animal shelters to help feed their hungry dogs and cats. The Providence Animal Rescue League– The Providence Animal Rescue League is a non profit animal rescue center who knows that there are lots of kids out there that care about the animals in our community. That is why they decided to create PARL Kids, a way to involve children who want to help support the animal rescue community. PARL Kids is a resource where children can come look for ideas to help animals in their community or even their personal pets. From creative art projects to fundraising ideas, thanks to PARL, kids are now able to involve themselves in the world of charity all on their own.